· My second tournament ever in August 2012, Heinola Treasure Hunt. First round in the same group with Pasi Koivu. Never forget! First and still the last win came true at K.O. 2014. ther was only 2 particitipents in our pool but win is always a win. · When i got in to Team Trilogy in 2016. Thanks to Tero Tommola for the invite! First GBO in 2016. The hole trip was amazing and I played pretty well depending that I was so excited that I was first time in a BIG tournament like GBO and playing in States. I am so blessed that I can get back to Emporia this year as well. Can´t wait! · Second place in Stray Disc Golf Tours last tournament in Spa Hills, Croatia, in July 2016. Will be heading there again this year as well. Every moment what I can spend on the course or teaching this sport that I love to the kids and youngters all over is priseless! 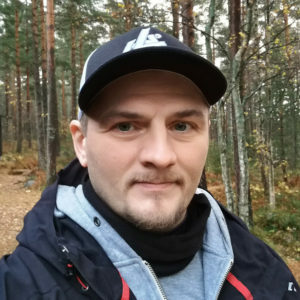 REAKTORI – biggest event for kids and youngsters in winter break has been one of the biggest this in my disc golf history. Thanks to Jari and Nils who have been there with me from the day one. During these five years I’ve been playing disc golf there have been loads of memorable moments, both good and bad. However, the one I will probably always remember the best is when I got to guide a blind boy in putting and throwing at speed radar. The joy and the excitement on his face – priceless! And this same kid came back next year to the same event just because he knew that I was going to be there again. NEVER LOSE, ALWAYS WIN! Then there is of course that moment when I heard that I could get in to Natural Born Disc Golfers. It was a dream come true! I have always enjoyed to teach and help new players to this sport that I so much love and when that is noticed – it´s dazzling! 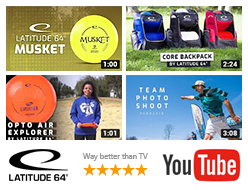 And I won´t ever forget that moment when I heard that I was invited to become an Ambassador to Team 64 for Latitude 64. Really a dream come true!!! I just love the people in this sport. Where ever you go. If you go to a local course you will find extremely nice people. I have been blessed to meet so many new friends true this 5 years I have been playing and can´t wait to meet more. And which other sport you could get a chance to play together a round with such as big names like: Nils Iso-Markku, Jalle Stoor, Seppo Paju, Janne Hirsimäki and Dixon Jowers. Or sit in the back seat with guys like Greg Barsby and Nikko Locastro. For now I have only talked with Jeremy Rusco, Ricky Wysocki, Johne McCray of Eric McCabe but hopefully I will get a change to play with these guys some day in a same group for round of disc golf.